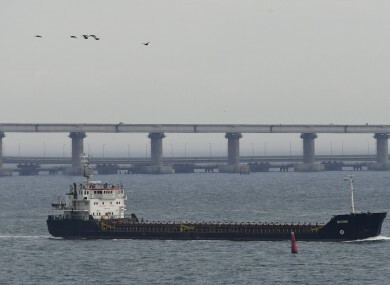 The ship makes way near to the Kerch bridge, in background, near in to Kerch, Crimea. UKRAINIAN PRESIDENT PETRO Poroshenko has warned of the threat of “full-scale war” and said Russia had sharply increased its military presence on their shared border as tensions escalate between the ex-Soviet neighbours. Today a court in Simferopol, the main city in Russian-annexed Crimea, ordered 12 of the sailors to be held in pre-trial detention for two months. Three hospitalised sailors were also formally detained for two months. The rest are to appear in court tomorrow. It has raised fears of a wider escalation – in a conflict that has killed more than 10,000 people since 2014 – and prompted international calls for restraint. President Vladimir Putin today warned Ukraine against any “reckless acts” after Kiev declared martial law in response to Moscow’s seizure of the navy vessels. The Ukrainian parliament voted yesterday in favour of Poroshenko’s request for the introduction of martial law in border areas for 30 days. In a phone conversation with German Chancellor Angela Merkel today, Putin expressed “serious concern” over its introduction. Russian state television aired footage late last night of some of the captured sailors being questioned by Moscow’s security services. One of them is heard saying “the actions of the Ukrainian armed vessels in the Kerch Strait had a provocatory character” – parroting the version of events put forward by Russian authorities. The European Union, Britain, Canada, France, Germany and others expressed support for Kiev yesterday, in statements pro-Kremlin newspaper Izvestia denounced as “predictably anti-Russian”. The foreign minister of Austria, which holds the rotating EU presidency, said today that the bloc will next month consider further sanctions against Moscow over the flare-up. UN chief Antonio Guterres today called for “maximum restraint,” urging both sides “to take steps without delay to contain this incident and reduce tensions”. Email “Ukrainian president warns of threat of 'full-scale war' with Russia”. Feedback on “Ukrainian president warns of threat of 'full-scale war' with Russia”.